This is a review of modules that can be used to find out where some other module is installed locally. Typically this consists of looking for the module in the directories listed in @INC. But there are various reasons why you might not want to load the module, so most of the modules described here get the path without having to load the module. Before we dive in, it's worth recapping relevant parts of how modules are loaded. When you require HTTP::Client or use HTTP::Client, perl ends up running require. The module name is converted into a partial path, where HTTP::Client becomes HTTP/Client.pm. The directory path separator will always be / in this partial path, even if the correct directory path separator for your operating system is something else. require looks in %INC to see if the module has been loaded, and if not, it searches the list of directories in @INC, looking for the module. If found, the module is loaded, and %INC is updated: the key is the partial path, and the value is the full path. See perldoc -f require for more of the gory details. Each module is presented in turn, with a SYNOPSIS style code sample. Then all the modules are compared, and I end up with recommendations. If you use the -n (or -no-require) switch, then mwhere will scan @INC, and not load the module. Without that switch, the script requires the target module, then gets the path from %INC. It seems a little odd to me that App::moduleswhere has the documentation for the script, and mwhere itself has no embedded documentation, so man mwhere or perldoc mwhere gets you nothing. and first looks to see if the target module is in %INC, returning the path found there if it is. If it isn't found in %INC, then @INC is scanned. The distribution also includes the whichpm script, which is just a wrapper around the module. By default it reports both path and version; the -q switch results in the path only. installed($module) returns true if the module is installed (in @INC). loaded($module) returns true if the module is loaded in the calling process. filename($module) returns the partial filename for the module. Eg HTTP/Client.pm for HTTP::Client. loaded_filename($module) returns the full path that the specified module was loaded from, if it's in memory, otherwise false. functions($module) returns a list of the names of the functions defined in the module's namespace, if the module is loaded. function_refs($module) returns a list of code refs, for all functions defined in the module's namespace, if the module is loaded. function_exists($module,$function_name) returns true if the specified function is defined in the specified module. methods($module,@options) returns a arrayref of methods defined in the module, according to the options passed. Returns undef if the module isn't loaded. See the documentation for more details. subclasses($module) returns a list of all the currently loaded modules that are subclasses of the specified module. I'm not sure why everything is provided as a class method rather than functions, but maybe some of the many modules dependent on Class::Inspector are subclasses, which would explain it. package() returns the package that the instance was created for (i.e. the name of the module that was passed to the constructor. loaded() returns true if the module has already been loaded. require() loads the module into memory, using Module::Runtime. root() returns the directory in @INC where the module was found. version() returns the $package->VERSION if the module is loaded, otherwise it uses Module::Metadata to parse the version from the source. It uses Path::Class to construct the full path from the module name and the relevant directory in @INC. The use of Path::Class means that Module::Filename has 38 dependencies. Module::Finder is an interesting module, with a quirky interface. So much so that it took me a while to work out how to get it work, and I still don't understand all of it. By default it will search through @INC looking for modules, and for your modules of interest you get a hashref containing information, including the path. Unless you constrain the search, it will recurse through all the directories in @INC, which takes quite a while. The paths parameter is used to constrain the search. The + for HTTP says to only look for things in the HTTP directory, and no deeper. Look at the documentation to learn about the other options for constraining the search. The dirs parameter provides a list of directories to search; if not specified then Module::Finder will look through @INC. The following methods do trigger the loading of the target module; read the documentation for more details. Note that the documentation also caveats "From here down reliability drops rapidly!". packages_inside() returns a list of the packages defined in the module. package_versions() returns a hash, the keys of which are the packages from packages_inside(), with the values the version, if one is defined. modules_used() returns a list of the modules use'd or require'd. modules_required() returns a hash, the keys of which are the modules in modules_used(), and each value is an array ref, which contains a list of the versions required or an empty list if no version was specified. subroutines() returns a hash, the keys of which are names of subroutines defined in the module, and the values are hashrefs with information about the subroutine. superclasses() returns the value of @ISA for the module. subroutines_called() returns a list of all the subroutines called. There are a few more things the module can do — the interested reader is directed to the documentation. It uses catfile from File::Spec::Functions to ensure paths are generated portably. get_source($module) returns a string containing the source of the module. acts_like_fh() returns true if passed a scalar which acts like a filehandle. This is an odd function to include in the module; it's used internally by locate(), but I think I would have kept it private. is_mod_loaded($module) returns true if the module's partial path (see above) is found in %INC. is_pkg_loaded($module) returns true if the module appears to have been loaded; this is different from is_mod_loaded() because it looks for a symbol table in the %main:: stash. This module has a major flaw: when you use locate($module), if $module hasn't already been loaded, then it finds it in @INC, and then caches the path in %INC. So if you subsequently try to require or use the module, it won't actually be loaded, because its appearance in %INC tricks Perl into thinking it has already been loaded. The module's author, Dan, has just given me co-maint, so I can fix this bug. Module::Mapper provides one function, find_sources(), which searches either @INC and/or a specified list of directories, looking for one or more module names. It returns a hashref, which is keyed off the module name, with the value being a list of paths. The first path in the list is the absolute path to the module. Modules takes an arrayref of module names. If All() is true, it will look for all modules under the namespaces of the modules passed in the Modules option. If IncludePOD() is true, then the search will look for .pod files; any pod file associated with each module will be included in the results arrayref. If UseINC() is true, then the search will taken in all directories in @INC.
Libs takes an arrayref, which can be used to provide additional directories that should be searched. Output can be used to provide a path which is used to remap the modules, and scripts if you specified any. See the doc for more details on what this does. Project provides a project root directory, which will be searched. I'm not really sure what this does. Verbose can be used to provide a coderef; the referenced code will be called with diagnostic messages as the search progresses. The design of the interface seems a bit curious to me, but the SEE ALSO says that it was created to support Pod::Classdoc and PPI::HTML::CodeFolder, so perhaps the design reflects the design of those modules. Module::Path is a module I wrote while working on my review of CPAN modules for getting module dependency information. A number of modules expect the path to perl source, but I wanted to provide a module name. On searching CPAN I only turned up a couple of modules, but they either seemed to have too many dependencies, or had potential issues. So I whipped up Module::Path. While continuing to work on the other review I subsequently found more modules, and that prompted this review. Module::Path uses the right directory path separator for your operating system, and ignores any code references it finds in @INC. It has 3 runtime dependencies: Exporter, strict, and warnings. Similarly, all_installed() will report all paths where the module was found in @INC.
is_valid_module_name($module> returns true if $module looks like a valid module name. find_in_namespace() returns all modules found in @INC that are under a given namespace. So find_installed('Furl') returns Furl::ConnectionCache, Furl::Headers, Furl::HTTP, Furl::Response, Furl::ZlibStream. module_path() returns the relative path for a module, as it appears in %INC, so module_path('HTTP::Client') returns HTTP/Client.pm. module_fs_path() is like module_path(), but it uses the appropriate directory path separate for the local operating system, rather than always using /, which module_path() does. path_to_module() does the inverse of module_path(), converting a partial path to a module name, and analogously fs_path_to_module() does the inverse of module_fs_path(). The all_files() method works like first_file(), but returns all instances found in @INC, not just the first one. The first_dir() and all_dirs() methods are analogous to the _file() methods, but find directories rather than files. Pod::Perldoc is the module that provides the guts of the perldoc command. The following table shows the result of benchmarking all of the relevant modules. I looked up the path for HTTP::Client 100,000 times. The code used is basically what was presented in the examples above. For the OO style modules, where the constructor is passed the module name, obviously I called the constructor. But for Module::Filename I called the constructor once, before running the benchmark. That's a surprisingly wide spread. Some of the modules are doing more than simply looking up the path, and some are built on generic modules which do a lot more when constructing directory paths. 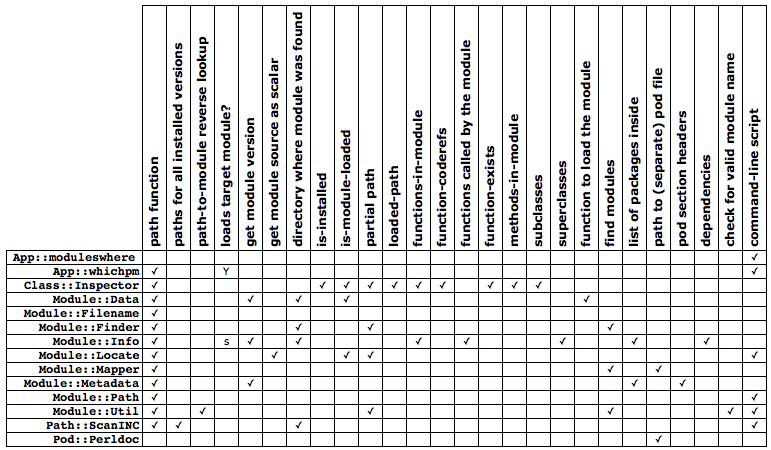 The following table shows the number of run-time dependencies for each module, when running the example code given for each module above. As you can see, there are a lot of different functions provided by the various modules, with a lot less overlap than I expected. The 's' for Module::Info reflects the fact that some of the methods can trigger the loading of the module. If you just want to get the path to a module, Module::Path is your best bet: it's the fastest and has very few dependencies. This was by design, so that someone could use it in another module without fear of unexpected bloat. This might seem like I've cheated, but I've basically optimised for the same things I tend to evaluate when benchmarking modules in these reviews. If you want additional information, such as version and whether the module is in the core, then Module::Info is not a bad choice. But be careful, as some methods can trigger loading of the module. Depending on what other information you want, Module::Metadata and Class::Inspector are also worth a look.